Today is reveal day for my Facebook Group called Art Quilts Around the World. The theme was Under the Surface. I took that as under the surface of water or earth. I was not feeling the love of this challenge based on these ideas. I had made a few mermaid quilts and I wasn't into fish quilts. I stalled on this project. Usually I get an idea right away. I then thought about being under the surface as far as our personalities are concerned Sometimes our true personality are hidden from the public by choice or because of circumstance such as our jobs, social gatherings and in public in general. People don't get to know us because we are choosing to keep our real persona under the psychological surface or it may be required because of our professions. 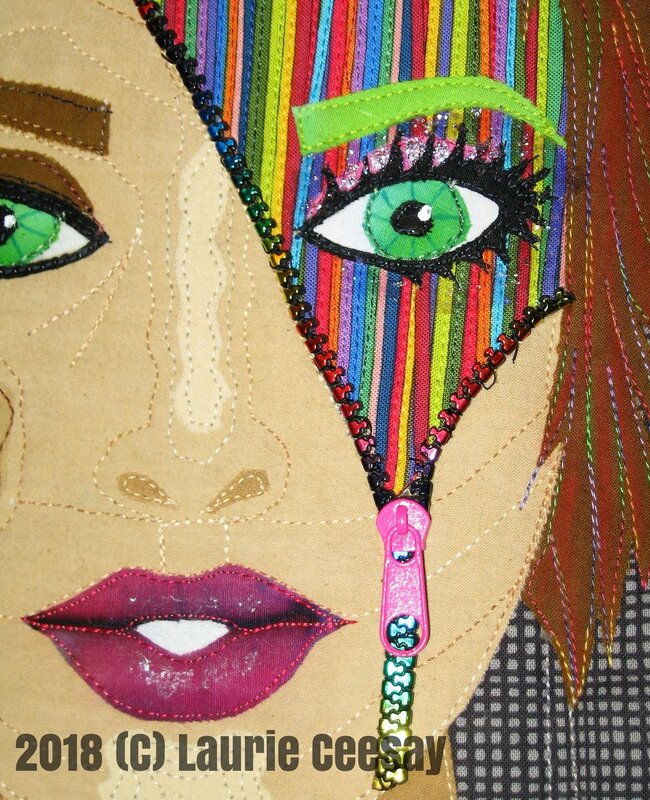 I had fun with the zipper idea of slightly opening up the face and the true self is visually viewed underneath. I selected browns and grays for the majority of the public "face" and underneath is the fun more interesting part of the persona. By using the browns and a very boring background I was quite bored with this portrait because I really want to embellish the heck out of it! But the point of the theme was to show the image, though conservative and mainstream, as it needed to be. I found the fantastic narrow stripe fabric at Blue Bar Quilts in May and it was in the Christmas fabrics section. I don't see Christmas but I do see fun and full of activity!! I used this fabric to represent the inner persona and added a bright green (fake looking) eyebrow applique and some bright pink for the eyelid. I wanted to spend all my time in this small area because my true persona is here. This is a close up of the face. The pink batik used in the mouth had a lot of muted stripes and I fussy cut the mouth applique to get shadow dimension and it turned out great without lots of work. The hair seemed to blend too much into the boring background so I used some lighter colored Derwent Inktense fabric pencils to add more contrast. I added some nail polish for eye glitter to the striped side of the face. The zipper was hand tacked to the quilt when everything else was finished. I originally wanted to use the beige zipper on the left because I loved the metal teeth but the tape part was too wide and I couldn't see it fitting into the face area. The other zipper is something that I had in my stash. I think it is meant to be a bracelet. I chose to use the pink zipper pull because it is my favorite color. When the quilt was finished I learned to love the idea behind the quilt.